Camp Moriah is a six month discipleship programme. Every year around 50 children graduate from the Mathare Valley Secondary School run by our partner, Mathare Community Outreach (KEN01b). At the end of the academic year they sit a school leaving exam and on the basis of their results they can apply for entry into private and government training institutions. However, it takes months to get the results and to process the applications. These young people are living in a squalid, unsafe environment. During the 9 month gap between sitting their exams and starting their training many of them fall into trouble. Many of the girls become pregnant and the boys get into crime, drugs and alcohol abuse. Many of the good kids, the church kids, have their lives messed up in this period. Since 1999 BHW has been partnering in the Mathare Valley with MCO-OCC. Over that time the school has grown from around 100 children to more than 1,500 so education has been part of the strategy since the partnership began. Other donors came along and BHW pulled back from the regular funding of education, however, in 2013 we began again. 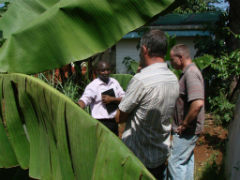 In 2009 MCO was given a small hostel in Maseno, near to the Uganda border (KEN06). Vulnerable children were living there. BHW has been working with MCO to attempt to make the hostel self-sustaining and a number of initiatives have been commenced. However, MCO was not able to sustain it and over subsequent years the number of children dwindled. It is in an ideal location for a discipleship programme. The first programme was initiated in 2013 as a pilot. It proved to be very successful and so the programme has continued. The purpose is to build on the experience of the first year and develop the programme. Up to 25 young people are selected each year. The beneficiaries will be the young people / school leavers who participate in the programme and their families. We love the strategy here. Large amounts of resource are poured into the children at the primary and secondary school level. Good relationships are formed with the young people and their families. This programme fills a huge hole in their successful development by filling in a time gap at a very important time in their lives. We like it that this programme is holistic dealing with spiritual, emotional, relational and developmental issues. We like it that these young people get to leave the Mathare Valley. It is a very dangerous place for them. We hope they will see another world out there, that they will aspire to something outside the place where they were brought up and that some would choose to come back later to help. Daniel and Magdeline Ogutu oversee the development of Camp Moriah. They have been involved in the Mathare Valley for more than 20 years. In those years they have commenced churches, founded schools, started feeding and micro-enterprise programmes and discipled and led many people out of their difficulties in the Valley. Dinen Ouma is the leader of the programme. He joined the MCO team in April. 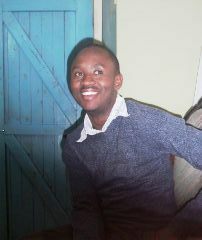 He has studied law for four years at university but is most interested in development and discipleship. After completing his law training, he trained in discipleship for one year and then joined Trinity Fellowship and worked with them for three years. He then worked with Missions of Hope doing one year in Kenya and two in Rwanda, working with university students. He was also involved in establishing sustainability projects in Rwanda. The vision is: To raise a generation of responsible young people holistically equipped through the Word of God. At the end of the course they receive a certificate. I am into alcohol addiction and I find myself disturbing everybody. I first got into alcohol drinking whilst I was in class six and I begun bit by bit, one sip after another. Later on in high school I was a drunkard as I used to take alcohol severely. I have also tried smoking bhang and taking a drug substance called “kuber”. All this I used while I was still in high school. I am willing to stop using drugs and stuff such as alcohol because my stay at Camp Moriah is a big resource to me because I don’ t find the time to get involved and also my conscience has been revived - something in me tells me that this was wrong. Some of the challenges that I face personally as an individual is that my friends call me a pretender and all sorts of names because they are noticing a change in me. I am so grateful for the advice that I have gotten from my teacher at Camp Moriah and student friends as well and before the program comes to an end I would like to give my life to Jesus Christ.